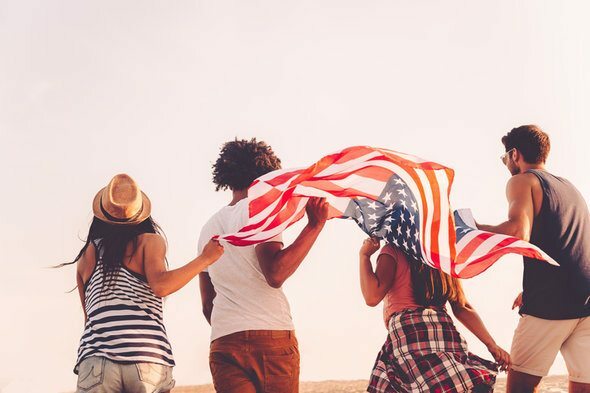 The definition of the American Dream will vary depending on who you ask. For some, it means a white picket fence, a trimmed green lawn and 2.5 children. For others, it means achieving your own personal goals and dreams, regardless of your background. Certainly the American Dream includes success and living a fulfilling life, whatever your definition may be. For the second year in a row, SmartAsset sought to find the best cities for living the American Dream. To find the cities where the American Dream is still alive and well, we started with the 261 largest cities for which we had data. Then we looked at each city’s diversity and intergenerational economic mobility – both important factors when considering the American Dream. We also looked at homeownership rates, home values and the unemployment rate in these cities to see how their residents fared. For more on our data and how we ranked the cities, see the data and methodology below. Tie for first. 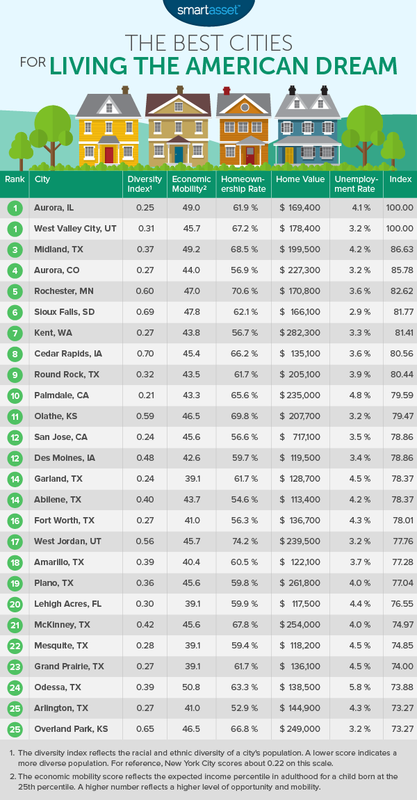 Aurora, Illinois and West Valley City, Utah are tied for the top spot in our study. Both cities ranked well across our metrics. Aurora stands out by having the fifth-highest mobility score overall, while West Valley City has the 14th-lowest unemployment rate. Lone Star State. For the second year in a row, Texas dominates our study. The Lone Star State claims no fewer than 12 spots in the top 25. The capital comes in last. In an ironic twist, Washington, D.C. was last in our overall American Dream index. Its diversity and mobility scores weren’t enough to stand out and its unemployment rate was higher than the average. Further, the homeownership rate landed under 40%. Way up from the 44th spot last year, Aurora, Illinois impresses by tying with West Valley City, Utah as the best place to live the American Dream in 2017. Aurora moved up the ranks with improved mobility numbers – its mobility score was 49. That ranked second in the top 10 and fifth overall. This means that the citizens of Aurora have the opportunity to move to higher economic percentiles than the generations before them. Further, Aurora’s unemployment rate dropped by about 2%. A suburb of Chicago, Aurora lies within the Illinois Technology and Research Corridor, a huge region of industry and commerce. While West Valley City was able to hold on to its number one title, it shares that spot this year with Aurora, Illinois. This Salt Lake City suburb scored solidly across the top 10, ranking fifth in diversity and fifth in home value. It also has a mobility score of 45.7, which scored 22nd in the study. What contributed to West Valley City’s shared win was partly its dip in homeownership, down about 3% from last year. However, this year’s percentage of 67.2% still lands at the third-highest out of the top 10 cities. The city’s unemployment rate did increase a bit though, lowering the city’s overall index score. Just like last year, Midland carries one of the highest scores when it comes to intergenerational mobility. It has the highest score within the top 10 cities in this metric. The Tall City’s homeownership rate increased by 5% as compared to last year. This good kind of growth may be no surprise since Midland also ranked in the top 10 of our best boomtowns of 2016 study. Midland’s unemployment rate did see a slight bump from 3.3% last year to 4.2% this year. This is one reason why the city slipped a single spot in our ranking. Not to be confused with our top pick in Illinois, the city known as The Gateway to the Rockies ranks as the fourth-best city to live the American Dream, up from the fifth spot last year. We recently named it the third-best city to own a home. Aurora’s numbers barely saw any change in diversity, mobility and the homeownership rate from last year, maintaining a nice stability. Its unemployment rate also remained virtually unchanged, which was good enough to rank 14th in the study. Aurora is an affordable and appealing place to live. Although one of our newcomers to the American Dream top 10, Rochester is no stranger to accolades. It ranked as the best city for working women, as well as landing on the 10 best cities for children. While Rochester is unfortunately not the most diverse city (it ranks very near the bottom), it does provide opportunity for mobility, ranking 11th overall in this metric. Rochester’s high homeownership rate of 70.6% also helped it climb the rankings, as did its low median home value and unemployment rate. 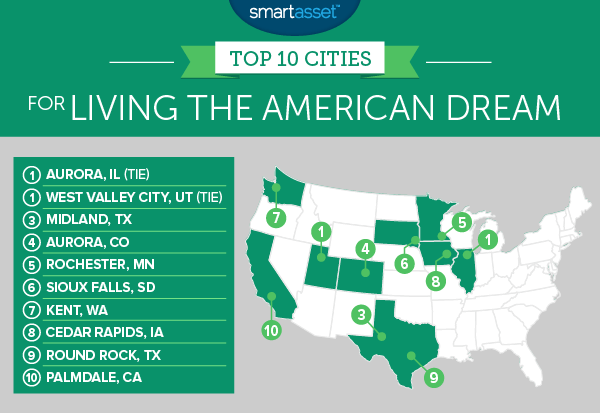 Sioux Falls is another new name in our American Dream study, standing out for its solid scores across our metrics. It impresses with the fifth-best unemployment rate at 2.9% as well as the ninth-best mobility score. The median home value poses an affordable option, which coincides with the 62.1% homeownership rate. However, Sioux Falls ranks even lower than Rochester when it comes to diversity. It landed in the 252nd spot out of 261 cities. Last year, Kent took the 32nd overall spot, so it was a big jump to the seventh spot this year. Interestingly, Kent’s economic mobility score remained at 43.8 from last year. Its dip in unemployment rate, from 4.5% to 3.3%, giving Kent a boost. REI has its headquarters in Kent, contributing to the city’s economy. Its diversity score saw little change, though it went up very slightly, from 0.29 to 0.27. The homeownership rate also dipped slightly, which is interesting considering the median home value dropped to the more affordable price of $282,300 compared to last year’s $317,100. Last year, Cedar Rapids tied with Plano, Texas for the sixth-best city for living the American Dream. Although Cedar Rapids dropped a couple spots, it was able to stay in the top 10 unlike Plano. The second-largest city in Iowa, Cedar Rapids was able to maintain a decent mobility score, ranking 36th overall this year. The city also saw a slight increase in median home value. Known as the City of Five Seasons, Cedar Rapids boasts a big city feel without any of the hassle, leaving its inhabitants a fifth season “to enjoy all other seasons, and to enjoy life,” which sounds like an ideal setting for the American Dream. Despite its idyllic motto, the city has the worst diversity score in the top 10 and the sixth-worst overall. Down only one spot from last year’s ranking, Round Rock holds steady in the American Dream top 10. This year, Round Rock scored a slightly better diversity number, as well as an almost 2% increase in its homeownership rate. In fact, as the Austin-Round Rock metro area, Round Rock landed as the second-best housing market for growth and stability in 2016. However, the city’s unemployment went up a bit, from 3.1% last year to 3.9% this year. Closing out our top 10 comes the city with the best diversity score in the top 10. Of course when it comes to achieving the American Dream, diversity in the population able to reach the dream is key. However, despite having the most diverse population, Palmdale couldn’t quite compete in the other metrics. It had both the lowest mobility score (43.3) and the highest unemployment rate (4.8%) of the top 10 cities. Palmdale’s 65.6% homeownership rate ranked fifth in the top 10. To determine the best cities for living the American Dream, SmartAsset looked at the largest 261 cities for which we had data. Last year’s study we considered 250 cities. Diversity. To give each city a diversity score, we looked at the population percentages of different racial and ethnic groups. A lower number means a city is more diverse. This data comes from the U.S. Census Bureau. Economic mobility. This metric looks at the changes in a family’s social position between generations. A higher number means more mobility. This data comes from The Equality of Opportunity Project. Homeownership rate. The homeownership rate looks at the percentage of homes that are owned by its inhabitants. This data comes from one-year estimates in the U.S. Census Bureau’s 2015 American Community Survey (ACS). Home value. This metric looks at the median home value in each city to indicate affordability. These numbers represent one-year estimates from the U.S. Census Bureau’s 2015 ACS. This is a change from last year’s source, Zillow. Unemployment rate. This metric looks at the unemployment rate by county. This data comes from the Bureau of Labor Statistics. To determine our overall index, we ranked each city according to each of five metrics. Then we averaged those rankings, weighting each one equally. Those averages determined the overall final index. The city with the best average ranking scored a 100, while the lowest ranking city scored a 0.